He helped Arkansas transform its economy and significantly improve the state's educational system. He became a leading figure among the New Democrats. The New Democrats, organized within the Democratic Leadership Council (DLC) were a branch of the Democratic Party that called for welfare reform and smaller government, a policy supported by both Democrats and Republicans. He served as Chair of the National Governors Association from 1986 to 1987, bringing him to an audience beyond Arkansas. Clinton made economic growth, job creation and educational improvement high priorities. For senior citizens, he removed the sales tax from medications and increased the home property tax exemption. 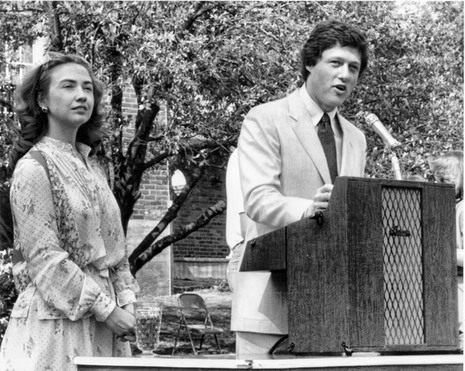 In the early 1980s, Clinton made reform of the Arkansas education system a top priority. The Arkansas Education Standards Committee, chaired by Clinton's wife, attorney and Legal Services Corporation chair Hillary Rodham Clinton, succeeded in reforming the education system, transforming it from the worst in the nation, into one of the best. This has been considered by many the greatest achievement of the Clinton governorship. Clinton and the committee were responsible for state educational improvement programs, notably more spending for schools, rising opportunities for gifted children, an increase in vocational education, raising of teachers' salaries, inclusion of a wider variety of courses, and mandatory teacher testing for aspiring educators. The Clinton's personal and business affairs during the 1980s included transactions which became the basis of the Whitewater investigation, which dogged his later presidential administration. After extensive investigation over several years, no indictments were made against the Clintons related to the years in Arkansas. In 1987 there was media speculation Clinton would enter the race after then-New York Governor Mario Cuomo declined to run and Democratic front-runner Gary Hart withdrew owing to revelations of marital infidelity. Clinton decided to remain as Arkansas governor (following consideration for the potential candidacy of Hillary Rodham Clinton for governor, initially favored, but ultimately vetoed, by the First Lady). For the nomination, Clinton endorsed Massachusetts Governor Michael Dukakis. However, he gave the opening night address at the 1988 Democratic National Convention, which was nationally televised, but it was criticized for length. Presenting himself as a moderate and a member of the New Democrat wing of the Democratic Party, he headed the moderate Democratic Leadership Council in 1990 and 1991. After apologizing to voters for unpopular decisions he had made as governor (such as highway-improvement projects funded by increases in the state gasoline tax and automobile licensing fees), he regained the governor's office in 1982 and was successively reelected three more times by substantial margins. A pragmatic, centrist Democrat, he imposed mandatory competency testing for teachers and students and encouraged investment in the state by granting tax breaks to industries. He became a prominent member of the Democratic Leadership Council, a group that sought to recast the party's agenda away from its traditional liberalism and move it closer to the centre of American political life. 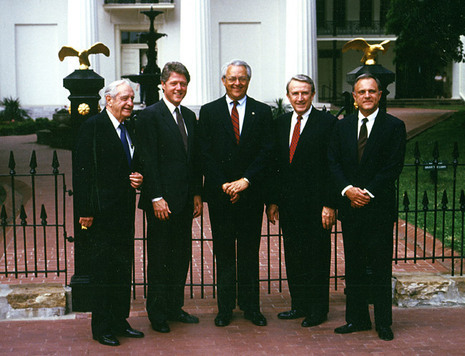 Clinton declared his candidacy for president while still governor of Arkansas. Campaigning throughout the state, he assured the voters that he would address their needs, and he was re-elected in November 1982.